This is cheap and simple solution for having battery powered RTC in Atari ST(E) machines. 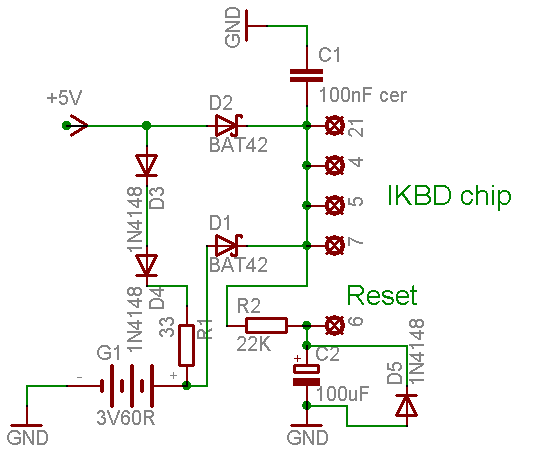 IKBD chip has internal clock, which is not resetted when chip gets reset signal. Power consumption is relatively high, about 1.3 mA, so it is not for longer periods with machine powered off.. With small AAA 1.2 V Ni-MH batteries, it can work about 2 weeks without recharge. Simplest is to bend up pins 21, 4,5,6,7 and solder on to. First turn on ST and then connect batteries, so it will reset. Charging current and voltage is limited by R1 and D3, D4 . Program for timesetting and automatic transfer from IKBD to GEMDOS clock: SETTI2K Usable for period 2000-2019 .